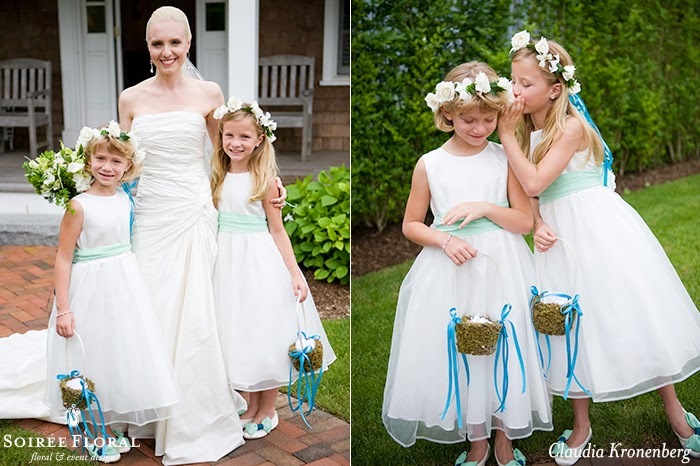 Are you an "out of the box" kind of bride? Well, if you are, you're in luck! 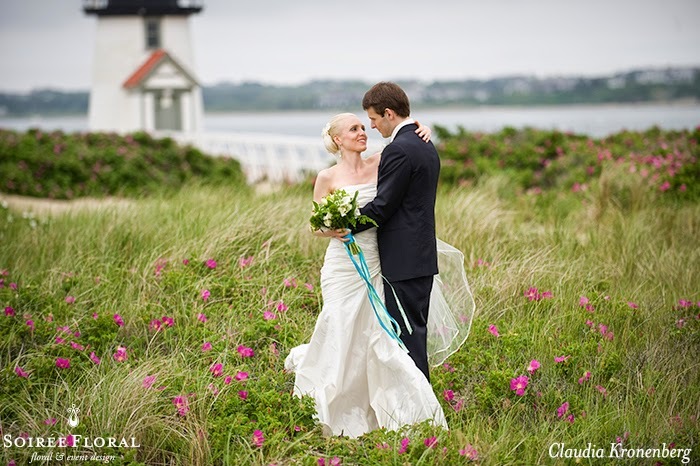 This week we're featuring a modern seaside wedding shot by the late Claudia Kronenberg, that took place at the White Elephant Hotel back in 2009. This bouquet is one of our favorite modern style bouquets featuring structured blooms like orchids, calla lilies, and poppy pods! 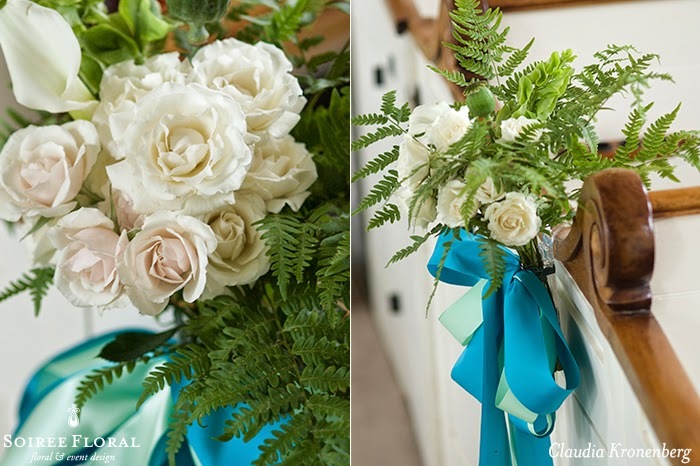 We love how the ribbon streamers keep it romantic and colorful with mint and turquoise ribbon. 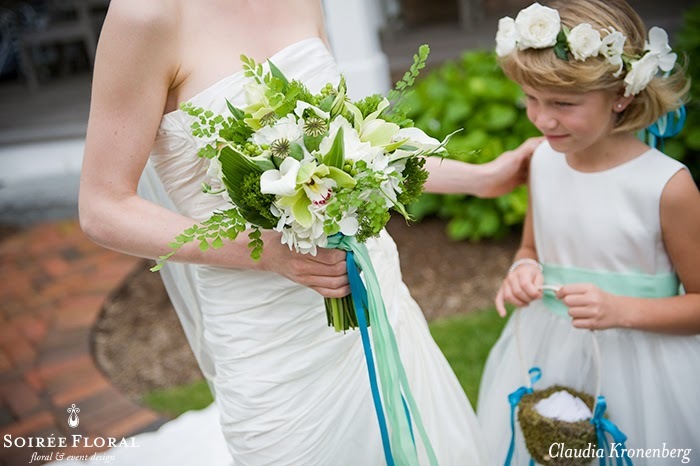 We kept the church fairly simple - lots of green and white. 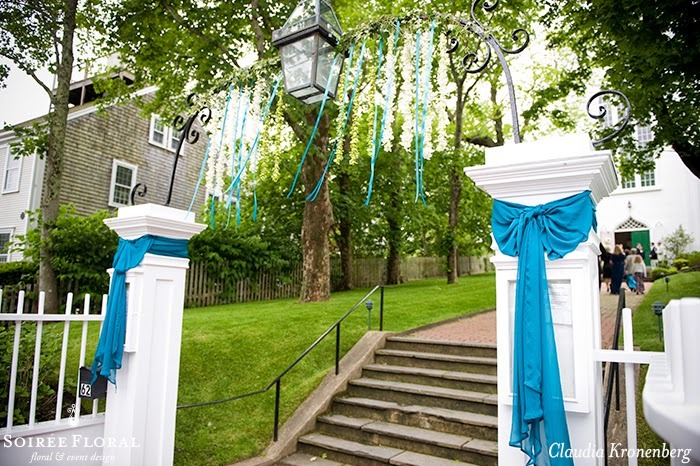 Guests were greeted at the archway to the church with ribbons and strings of orchids swaying in the wind. Such a fun, non-traditional way to dress up the arch! 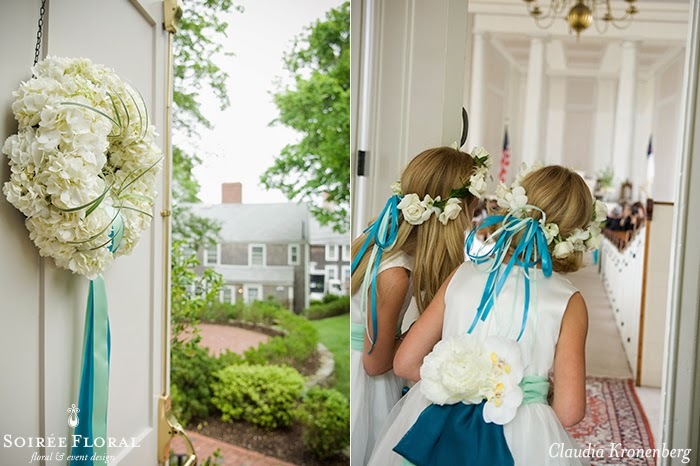 White hydrangea wreaths flanked the doors of the church and were hung with ribbon streamers in mint and turquoise. At the reception, guests were treated to whale truffles from Sweet Inspirations. 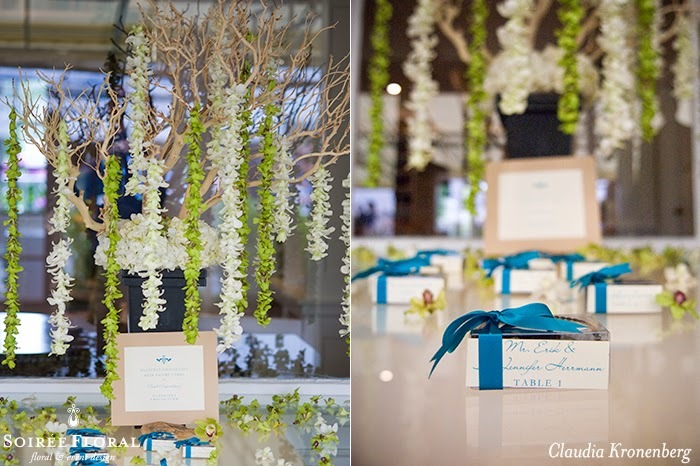 Our display was lush with strings of orchids hanging from branches with blooms scattered across the table. The bride created all of the paper products for her big day - a project not for the faint of heart! 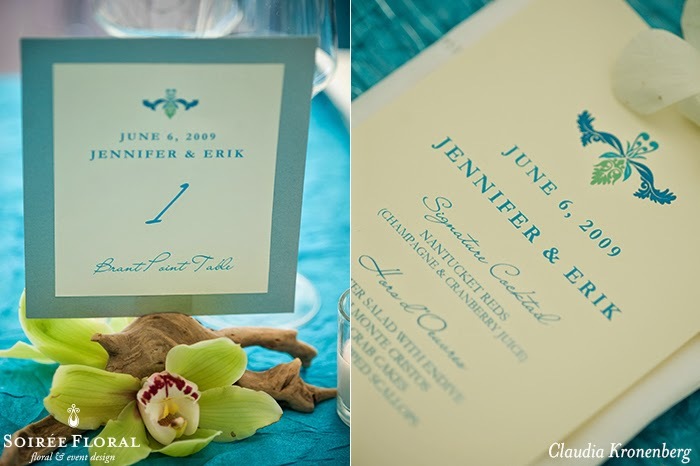 You can tell she put a lot of thought and spent a lot of time designing her menus and table numbers. 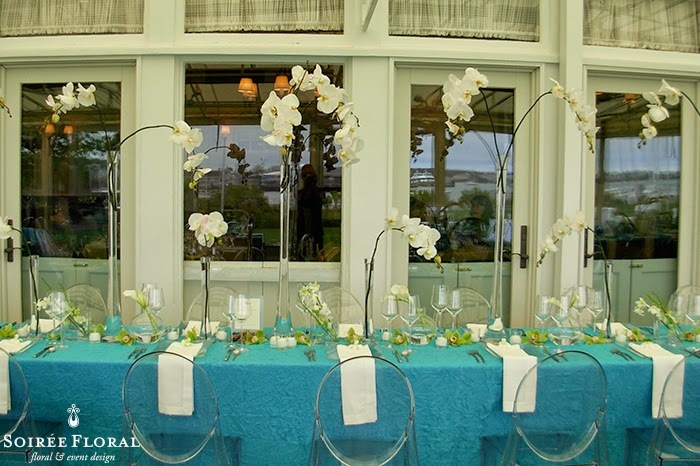 With mixed heights of white orchids at the head table and the ghost chairs, along with custom made linens took centerstage as the pop of color at the reception. 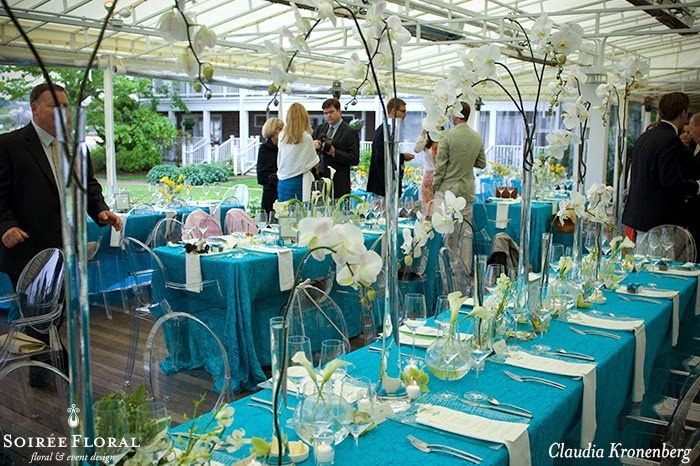 With simple, single bloom arrangements down the table the head table exuded simple, modern elegance. At the other tables we added a bit of color - yellow! 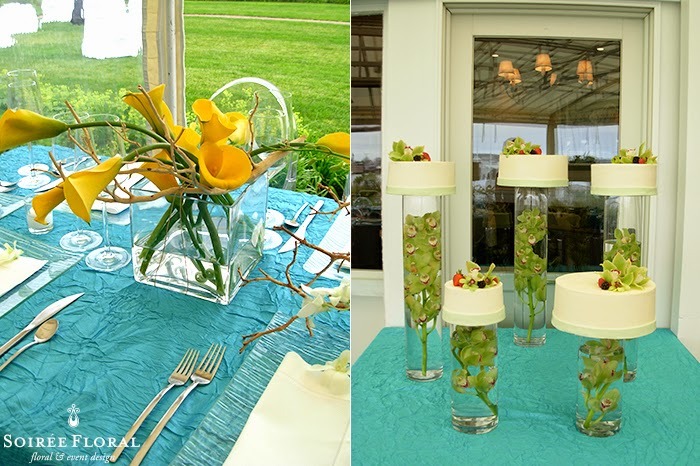 Yellow calla lilies mixed with greens and branches kept the look modern and kept the look interesting as your eye wandered through the layout. Perhaps one of our favorite parts was the cake display - submerged orchids topped with different cakes! Jen, our bride takes the cake (pun intended!) for one of our most creative cake displays yet! Here, Jen and her groom Erik enjoy a moment of peace at Brant Point after their "I Dos". Tabletop Rentals - Placesetters, Inc.
Don't forget! - If you're on Nantucket April 24th - May 7th be sure to check out "Small Works, Big Cause" a gallery show hosted by the Handlebar Cafe featuring work by Nantucket Photographers. Pieces by these photographers will be for sale and all proceeds will go to the Claudia Kronenberg Scholarship Fund.